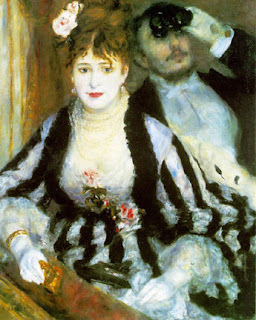 In Renoir's La Loge we see a cocotte sitting at the front of the box at the opera in front of a man who is probably her benefactor, her face painted white, lips red, displaying a generous bosom for all to see accentuated with the flowers she wears to display her cleavage to its best advantage. She is in a garish black and white dress that would have drawn attention to her even from a distance. Renoir has painted glistening pearls around her neck and white flecks in her eyes to further idealize her for the male viewer. 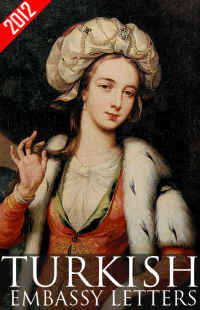 She is holding a pair of binoculars; her accessories complete her decorativeness to the man sitting next to her. She has an unfocused, vapid gaze, a passive looker, aware of being objectified. The man sitting next to her, on the other hand, is looking out at the audience with his binoculars, not even paying any attention to her. 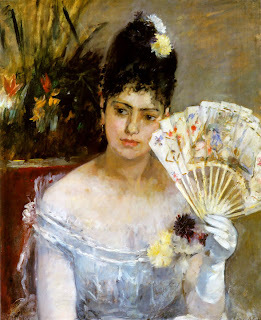 Berthe Morisot was probably aware of Renoir's La Loge when she painted At the Ball in 1875 since they were acquainted and she would invite him to the salons she held for her artist friends on Thursdays, at her house in Bougival. Even though Renoir was of middle class origins while Morisot was from the upper class, their shared passion for art, enabled them to become friends. In Morisot's painting we see another woman in an evening gown, wearing flowers and very little makeup. She is in a dress that is subtle and the flowers are not to draw attention to herself but to symbolize her innocence. She is a respectable, wealthy female at a ball. Her sideways, assured, contemplative gaze informs the viewer that she is a thinking woman. There is nothing in her eyes that tells us what she is thinking but she has a meditative expression and this is probably a scene out of Berthe Morisot's own experience. Like Cassatt, Morisot painted the inner world of the upper class female. Baudelair's explanation of the stupid, beautiful, adorned woman is visualized in Renoir's La Loge while Morrisot seems to be making a contradictory statement of her own in her painting, At the Ball,by showing for all to see that a woman who is beautiful could also be a thinking woman too.